I am originally from Austin, Texas, a city I know the mayor to be quite fond of, understandably. I lived there until my mid twenties. At 15 years old, I found myself living on the streets. I was 5ʼ2”, 95 pounds soaking wet, severely depressed, and completely lost. For a while, I kept to myself and tried to figure out how to survive. I felt it easier to find places to sleep and food to eat when I didn’t have anyone with me who might scare away approval or offerings. This put me at greater risk of experiencing violence. I found myself the victim of sexual assault and other violent crimes a number of times before this part of my life was over. Later I learned that this was extremely common, even expected, by most in my situation. It was difficult to trust anyone, but, eventually, and out of necessity, I did. After some time, I got to know most of the homeless folks in town. From then on, I was, more often than not, in the company of someone else. During the day it was common to be approached by Austin police and interrogated. An officer named Santiago was particularly fond of writing me tickets despite explanations that I couldn’t afford my next meal, let alone a ticket. For sitting on the steps (with permission) of a church on Guadalupe Street, he would write me a ticket for camping. If I was smoking at the time, heʼd write me a ticket for minor in possession. He would then tell me to put my cigarette out, I would, and he would hand me a ticket for littering. Heʼd smile and say, “See you tomorrow.” This went on for a couple of years and, as the tickets piled up, a cycle of tickets turning into warrants began. A homeless citizen naps in the afternoon 20 feet from a peace rally in downtown Madison. I was fed once a day a few times a week through a local program. I also benefited from their closet occasionally when I could find shorts that fit, or clean socks, or toothpaste. It was the only thing besides a shower that helped me feel like a human being. I had to fend for myself the rest of the time. This often included staying up late to wait outside a pizza or bagel shop so I could catch them throwing out the unsold food before it went into the dumpster. If I missed this opportunity, I could usually rely on food already being in the dumpster, but being so small, it was difficult for me to get into the dumpster in the first place. I eventually tried and became addicted to heroin. It was a favorite among the younger homeless. It was easy to fall into for those suffering from bipolar disorder and other depressive mental illnesses. I gave up most of my food money for the drug instead. It seemed convenient since it also suppressed my appetite and helped me forget that I felt like a subhuman. I experienced things no one wants to hear about and few can handle knowing. 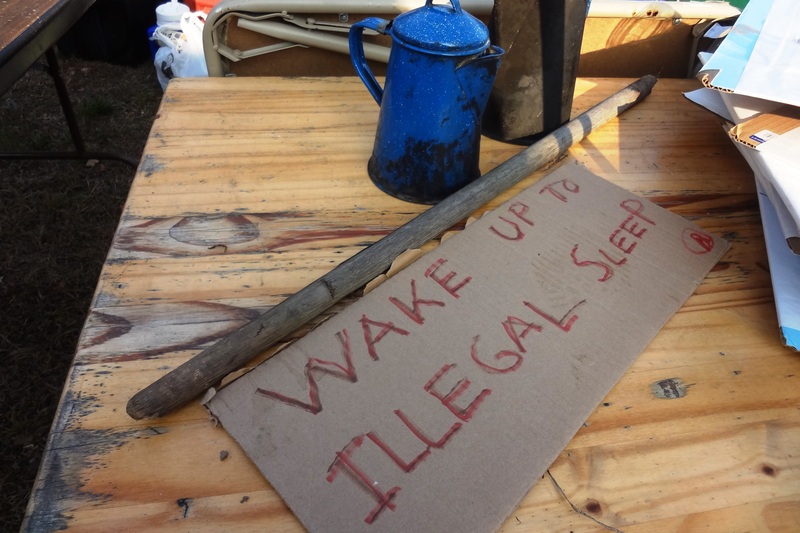 I eventually found a church that gave me permission to sleep on their property in a hidden spot. They knew I was vulnerable and it was the best they could do. It was the safest place I had found, and I was grateful. One night, unaware that I had permission to be there, a janitor called the police. They found me in the middle of fixing with a needle in my arm. They arrested me and sent me straight to the detention center. Being a juvenile worked in my favor. I was forced to spend a large amount of time in this detention center (which I later realized was much harder than any jail). When my time there was done, I was still a juvenile but no one in my family wanted to claim responsibility. I was sent to an inpatient rehabilitation facility where I lived until the day I was 18. Both of these experiences were great for me. I got clean, received counseling, and learned a lot. I relapsed but found my way back. Eventually I was very lucky to be offered a chance to be trained as a prep cook in a run down diner. Since then, I have been head cook, have managed kitchens, even entire establishments. I even took a diner on the edge of going out of business to ending up on The Food Network. I went to college for a few years but dropped out when Pell Grant funding was cut as I was uncomfortable being in debt. I am a fairly new addition to the beautiful city of Madison, but I love it deeply nonetheless. Three short years ago, my husband and I happily decided Madison was the city we wanted to call home and raise a family in. We began by accepting a job offer here. One of the many reasons I fell in love with Madison is because I see so much opportunity here as a potential entrepreneur. I am really looking forward to the day I can open my own business and do what I love most: feeding people wonderful food. Although many changes occurring here in the past three years have made us think about our decision, one issue has been particularly disturbing to me: the ongoing turmoil that surrounds our local homeless population. 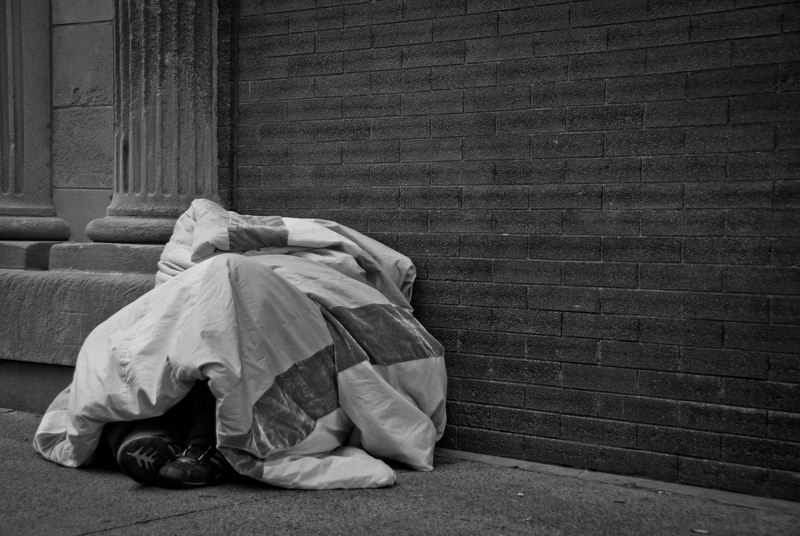 Many of the approaches being taken to deal with our homeless community are counterproductive. They are not bettering our city, or making it more visually appealing, or even saving it money. Instead, these approaches are putting an ugly face on Madison, wasting resources, and bypassing investment opportunities. When you are homeless you become a member of a community. A community often shunned by the sheltered community. This becomes your family, your neighborhood, your neighbors. When the “outside” community makes efforts to push you away, displace you, and create more obstacles than those you have already overcome just to be alive, that community is the last one you want to be a part of. It is ugly. It is unwelcoming and it seems dysfunctional and hateful. Why would anyone want to fight to be accepted into a group where so much effort is made to ignore someoneʼs existence rather than invest in their potential? I know many would like to believe that making someone feel like an outcast would encourage them to work harder to fit in. Not only is that false, but it makes them want to stay with the community, the neighbors, the family that they know. This shunning often encourages one not to make an effort to advance or change. This judgement and rejection adds to a personʼs already beaten sense of self. It is difficult to feel like trying when you already question the need to be alive and people make you feel like you donʼt deserve to be. Looking for employment can be exhausting and difficult for people who have addresses, phone numbers, clean clothes, transportation, and child care. Even with a classy resume and great experience it can take a person 6 weeks. In a bad economy, months. Disabilities? Years. Now what if you didn’t get breakfast? Or dinner the night before? How weak do you feel at the end of the day when you havenʼt had anything to eat? What if you are sore because you slept in the cold and had to wake up and stand in line to get a 5 minute shower only to put on dirty clothes again? What if you have boot rot? What if you spent all your energy the day before riding the buses all over town trying to make sure you had the right paperwork and a phone number to provide on an application. What if that energy just went to trying to find clothes and food, forgetting that most food affordable and available is non-nutritious fast food. What if you had had to carry everything you owned on your back because you have no where to store it? (Imagine showing up at a job interview with a camping pack.) These are real obstacles that the homeless face while trying to gain employment. 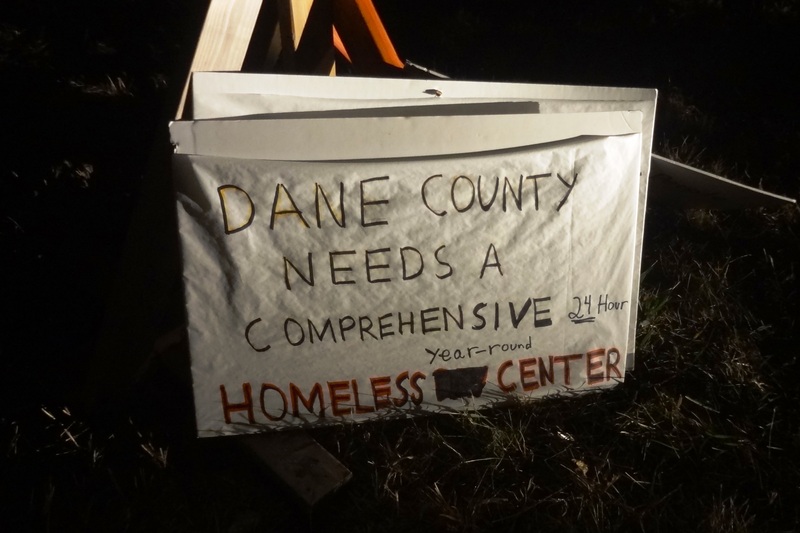 Sign at Occupy Madison homeless encampment. Not supporting, even cutting, services that help keep the homeless fed, clothed, and sheltered only contributes to the ailments that decrease their chances of succeeding. Many are convinced a “tough love” approach will somehow force them into a home and job and it simply does not work that way. For years after I had been back on my feet and working 40-50 hours a week, I was paying off old tickets and warrants. Every time I thought I was going catch up, I was kicked by having to pay for another “camping” ticket, years old, seemingly from another life. Every time I felt I had a little extra for groceries I would have to pay a court fee instead. Overcoming these obstacles IS work. So is fighting the stigma that all homeless citizens are lazy and donʼt want to work. How easily we forget the chance they could be veterans, or mentally ill, or physically disabled. The resources for these citizens are diminishing everyday. We invest in building large multi-space buildings in hopes to boost the economy in certain areas (East Washington for example). We must learn to invest in our citizens as well. We are losing potential entrepreneurs, mentors, consumers, volunteers, and even teachers by not doing so. arenʼt as worthy of help. But are we really the kind of city that would accept that as a reason to punish the majority who want to succeed? I do not believe that is the Madison way. I do not believe that is the Wisconsin way. I am now healthy, happy, and successful. I am able to contribute my skills and time to my community in hopes of making it better and more beautiful. My husband and I do well and support our local small businesses. Yes, I had to work hard to get here, but I would not be here if I had not had help. Help I would have been without had I not been a minor. Help that everyone without a home needs. This is a really good read. The city officials in my town do the same bit of community busting and try to starve the homeless out of existence. Keep on writing about your experiences. You are waking people up and saving lives.